Entries from Digital Intelligence tagged with "asda"
Asda has won the Christmas battle of the inbox and Aldi topped a separate consumer study for its ability to engage shoppers on a personal level with advertising and marketing, according to new research. 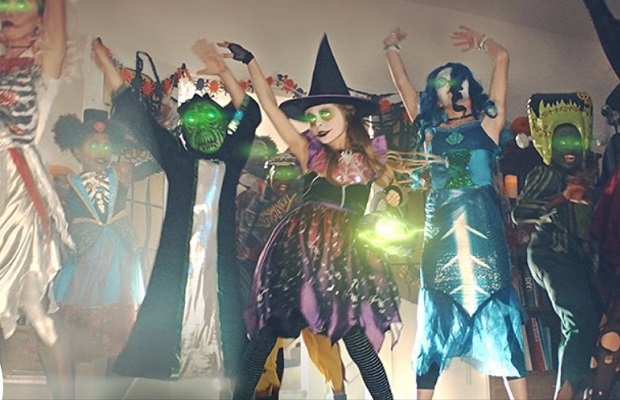 Walmart-owned Asda has launched its annual Halloween campaign with a TV ad that uses Shazam to linked to an augmented reality mobile experience. UK supermarket chain Asda Has launched a food waste matchmaking app, letting suppliers buy and sell food that would otherwise be dumped. Walmart has extended its private ad exchange, dubbed "Walmart Exchange", to Asda in the UK, giving brands access to its lucrative shopper data for targeted ads. Some of the world’s biggest brands, including Tesco, Asda and Ogilvy, will take part in the first-ever B2B conference on Muslim lifestyle - a sector worth trillions of pounds. Tesco and Asda have the most ‘pinned’ (shared) content on Pinterest, with recipe pages proving most popular, according to new research looking into UK supermarket perfomance on the social media scrapbooking site. .
UK retail giant, Asda, has partnered with ecommerce performance marketing company, HookLogic, to launch the company’s first venture into the European market as it looks to boost product exposure for it brand. Asda’s recently launched YouTube shopping channel ‘Mum’s Eye View’ has proven a hit, generating impressive traffic figures that show a growing appetite for branded digital TV channels. Travel retailers have seen the biggest gains online during the summer, but Netflix and ASDA Direct were the fastest risers overall, according to new data looking at the top 50 online retailers in the UK. The UK’s top 5 food retailers have had mixed results from their mobile customers, with Just Eat and Tesco getting the most from smartphone users with 14% and 13% boosts in traffic respectively, according to new data. New email data shows which brands consumers love enough to rescue them from the spam folder, including Apple, Amazon, eBay, Dorothy Perkins, Sainsbury’s and Match.com. Morrisons has announced plans to sell online for the first time, as Britain's fourth biggest supermarket chain saw its profits fall in 2012. Asda customers who shopped online last month have been overcharged for their groceries, with one claiming to have been charged nearly five times the correct amount, following a computer glitch. 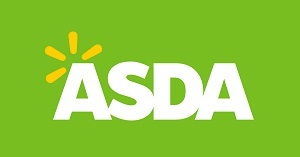 Asda – whose parent company Walmart is based in America – was hit by a powercut as a US storm caused a glitch in the company’s computers on 16 August. Amazon remained top of the UK online shops during August, followed by Apple and Argos, while the Olympics boosted visits to travel sites, according to new research. The findings, from the IMRG-Experian Hitwise Hot Shops List, indicate that London 2012 Tickets was the fastest moving retailer this quarter as consumers flocked online for precious Olympics tickets. On the Beach entered the top 50 for the first time this quarter, joining 10 other travel brands who all rose in the rankings of the Hot Shops List with the exception of easyJet, which retained its previous position. Walmart, the owner of UK supermarket chain Asda, has acquired a social networking firm in a bid to grow its online and mobile shopping businesses. The world's largest retailer said it was acquiring Kosmix, a US-based company that has developed a platform to aggregate and organise data from social networking sites. The value of the deal has not been disclosed, but commentators are speculating that it was in the hundreds of millions of dollars. The latest Hot shops list, compiled by the IMRG and Hitwise, reveals the top 50 online retailers in the Uk in the run up to Chistmas. The big news is the dramatic rise of Ticketmaster UK which broke into the top 10 for the first time in Hot Shops history. The fast movers for the quarter were Ticketmaster and GAME thanks to the announcement of the Take That 2011 tour and the release of Call of Duty: Black Ops. Boots was also among the fast movers (up 15 places) and showed strong year-on-year growth for the second consecutive quarter. 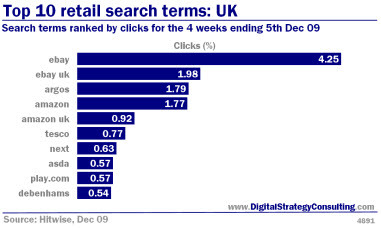 Search terms ranked by clicks for the four weeks ending 5th December 09.